Today I have an excerpt from Wildflower Park – Oopsy Daisy by Bella Osborne. Delighted to be part of the Avon Book blog tour. I’ve been jotting down my stories for as far back as I can remember… well that’s not exactly true. I remember writing a story when I was about nine and I was in Mrs Hurran’s class. The story was about a thief who stole the crown jewels but then didn’t know what to do with them. It went on for pages and pages, in my spiders dance handwriting, so my teacher typed it up and pinned it to the classroom wall. It was a proud day! Somehow life took over, I got a sensible job and the writing remained a hobby which other people puzzled over and which I adored. Over the years there have been dalliances into poetry, short stories and five unfinished novels. But I decided that 2013 would be the year that was going to change. I joined the Romantic Novelists Association New Writer Scheme which gave me a deadline to chase – a full length novel had to be completed and submitted for review by 31st August. I beat the deadline by a month! 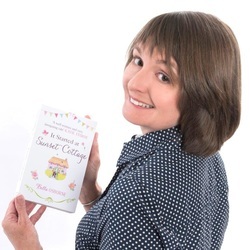 In 2014 I secured a two book contract with Harper Impulse, part of the HarperCollins Group, and my first novel ‘It Started at Sunset Cottage’ was published in ebook format on 12th February 2015 and paperback on 23rd April 2015. It went on to be shortlisted for the Joan Hessayon New Writers’ Award and the RNA Contemporary Novel of the Year 2016. ​My second book ‘A Family Holiday’ was published Summer 2016 and was shortlisted for RNA Contemporary Novel of the Year 2017. In 2016 I moved to Avon, which is also part of the wonderful HarperCollins family, to write bestsellers Escape to Willow Cottage and Coming Home to Ottercombe Bay. My books are released in four digital instalments ahead of the whole story being published a few months later. I am currently editing my sixth novel and writing my seventh. Watch this space for more details!